Topeka, KS, February 16, 2018– The Kansas 911 Coordinating Council would like to recognize the 911 professionals of Kansas on the 50th anniversary of the 1st 911 call. 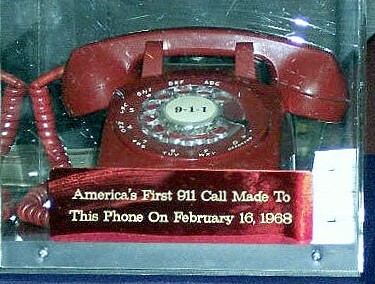 On Feb16, 1968, Alabama Speaker of the House, Mr. Rankin Fite, made the first 911 call from the Haleyville City Hall. From that small beginning, 911 technology has become more sophisticated in response to consumer expectations. Each advancement has improved our nation’s ability to get better, more reliable information to first responders so they can do their job of saving lives and property. Kansas PSAPs are the vital link in saving lives and property. The Kansas 911 Coordinating Council has worked to provide a statewide call handling system that is ready for Next Generation technology. In the coming months Kansas PSAPs on the statewide call handling system will be migrating to state-of-the art i3 standardized architecture. This upgrade will allow for new communications technologies to be utilized in contacting 911. The 78 PSAPs currently on the statewide call handling system are able to receive text-to-911. The future will bring the possibility of pictures, videos and telematics to 911 centers. https://www.kansas911.org/wp-content/uploads/2018/02/911-phone.jpeg 284 375 Lori Alexander https://www.kansas911.org/wp-content/uploads/2017/07/Header-Logo.png Lori Alexander2018-02-16 08:26:182018-02-16 08:33:26Happy Anniversary 911!